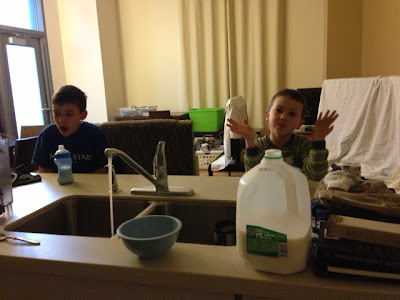 My Savvy Boys: party in my dorm room! party in my dorm room! you did read that title correctly. 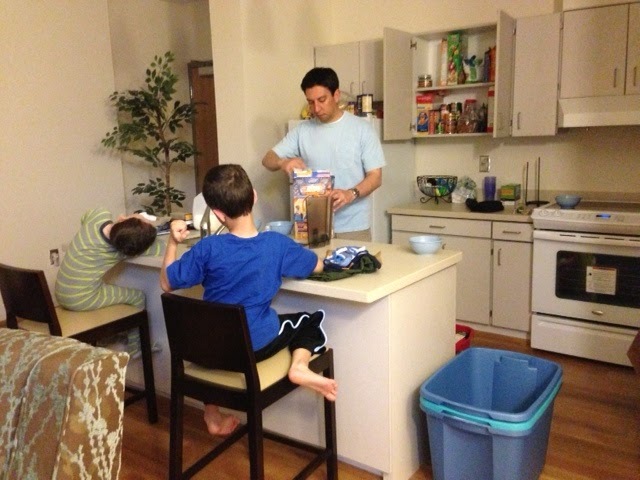 because, 4 days before my 36th birthday, bernie and i moved our family of 4 back into the residence halls. it has been quite the journey since january. last fall we decided it was time to move our party of 4 closer to work. we were spending far too much time in the car, and even more since the boys started playing baseball and basketball. 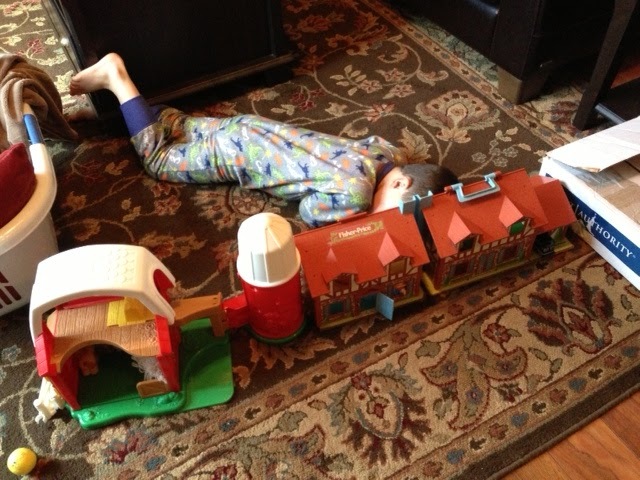 and that is just not how we want to spend their fleeting childhood years. so in January, we started going through 7 years of clutter and collections in the house. in February, we got a storage unit and started to make the place look a bit more presentable. on May 30th, we closed. 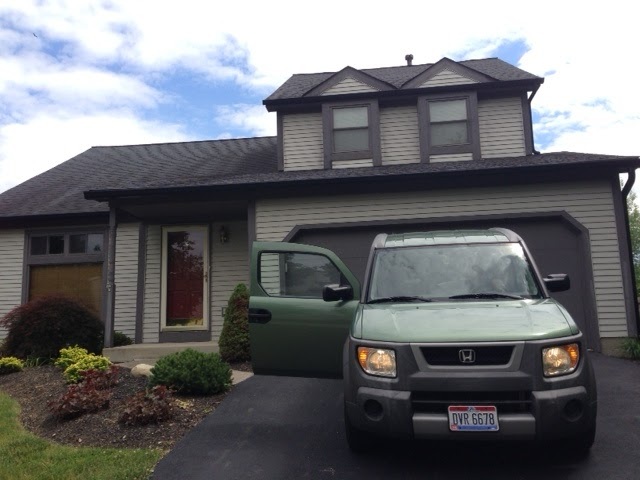 and today, bernie and i did some final cleaning and hauled one last load away from our first house. it was a major life moment. so, of course, i forgot my camera. i used the keypad to shut the garage, grabbed bern's phone, and snapped one last shot. clearly, i also forgot to shut the car door before taking this. so, here is the great keepsake shot of our last moments in the house. i have officially decided that packing could be used as a punishment for some crimes. i had a strong desire to fill the tops of boxes so they wouldn't collapse in on themselves. and would randomly wander around the house looking for something approximately 4x9 inches to fill the last bit of box. most of the time, i would find something just the right size. to go in the kitchen box. this should make for fun unpacking. we did also find many fun nostalgic items. 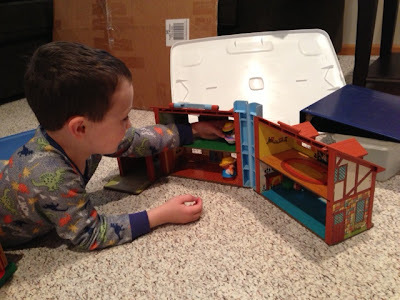 among them was Bernie's old Fisher Price house that benny adores. he quickly ditched the little round wooden people and replaced them with the more current plastic models. he also asked us many questions about why there was no TV in this house. 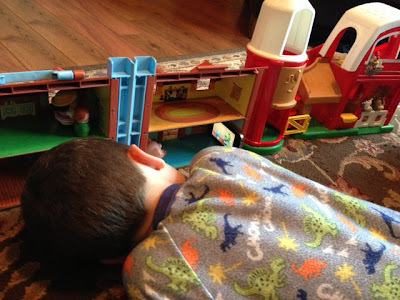 at one point, i was walking down the stairs and i thought benny had fallen asleep playing with the house. being the problem-solver he is, benny had commandeered an iPhone and was watching a show on it. if you look closely, you will note that both an old and a new little person has been stationed in a room on another floor of the house, facing the wall. clearly, they have misbehaved and lost their TV privileges. it's good to see that benny is comfortable holding others accountable. it does appear as though a small pig has retained his TV privileges. somehow i went from hey, sorry i was so busy trying to sell my house that i stopped blogging to plastic pig watches TV with my littlest human. as of today, my family is living in a residence hall. for most of us, this is actually old hat. bern and i were both RAs in undergrad, Assistant Hall Directors in grad school, and full-time hall directors in our first entry-level positions. anthony was actually the hall mascot in Baker Hall West for a brief moment, because we were still Hall Directors when he was born. benny, however, never had the chance. so, here we are, leveling out the "i've lived on campus" playing field for one month while we wait to get into our new house on July 1.
bern and i figured out what was bothering them one night when they asked what kind of bed they would have in the new house. they didn't realize that we were only selling the structure of the house, not what was inside of it. once they found out that they could keep all of their toys? 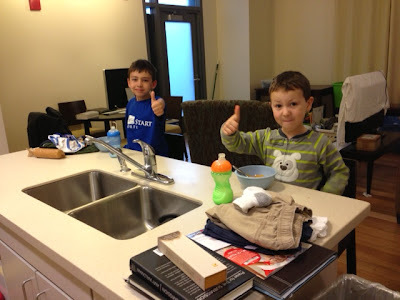 plus the breakfast bar in the temporary HD apartment was a real hit as well. life has been wild, but we are really excited for the next step in our journey together. and, yes, also excited about our brief stop back on campus.